Author(s): Natália G. Graebin, Taís Suhre, Plinho F. Hertz, Marco A. Z. Ayub. Biotechnology & Biochemical Engineering Laboratory (BiotecLab), Federal University of Rio Grande do Sul, Av., Bento Gonçalves, 9500, P.O. Box 15090, ZC 91501-970, Porto Alegre, RS, Brazil. Grape pomace is an abundant agro-industrial residue that could be used as a source of natural antioxidants, when using appropriate techniques for their extraction. 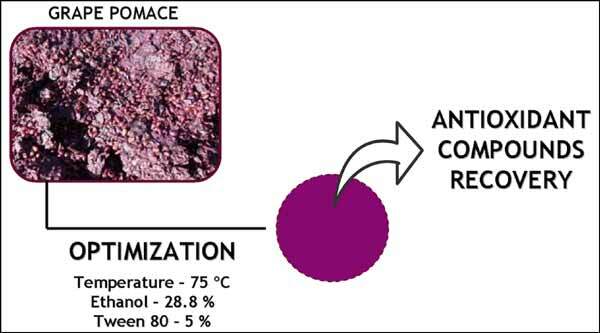 The solid-liquid extraction of bioactive compounds from grape pomace was optimized by experimental design. Temperature, ethanol, and Tween 80 amounts were evaluated by measuring the total phenolic content and the antioxidant activity of samples using the 2,2-diphenyl-1-picrylhydrazyl and 2,2’-azino-bis(3-ethylbenzthiazoline-6-sulfonic acid) methods. Optimal condition of extraction was: 75 ºC; ethanol amount, 28.8 %; Tween 80 amount, 5 %. The total phenolic content was 21.55 mg gallic acid equivalent/gdw, whereas the antioxidant activity was 9.13 mmol TEAC (Trolox equivalent antioxidant capacity)//gdw and 178.34 mmol TEAC/gdw, respectively. The variables showed to significantly affect the total phenolic content (p < 0.05), but only temperature and ethanol amount influenced the antioxidant activity. Results suggest that ethanol could be used to replace non-food grade and environmentally problematic organic solvents, while the use of Tween 80 could improve the solid-liquid extraction. Keywords: Bioactive compounds, central composite design, grape pomace, optimization, surfactant, solid-liquid extraction. Affiliation:Biotechnology & Biochemical Engineering Laboratory (BiotecLab), Federal University of Rio Grande do Sul, Av., Bento Gonçalves, 9500, P.O. Box 15090, ZC 91501-970, Porto Alegre, RS, Brazil. Keywords:Bioactive compounds, central composite design, grape pomace, optimization, surfactant, solid-liquid extraction. Abstract:Grape pomace is an abundant agro-industrial residue that could be used as a source of natural antioxidants, when using appropriate techniques for their extraction. The solid-liquid extraction of bioactive compounds from grape pomace was optimized by experimental design. Temperature, ethanol, and Tween 80 amounts were evaluated by measuring the total phenolic content and the antioxidant activity of samples using the 2,2-diphenyl-1-picrylhydrazyl and 2,2’-azino-bis(3-ethylbenzthiazoline-6-sulfonic acid) methods. Optimal condition of extraction was: 75 ºC; ethanol amount, 28.8 %; Tween 80 amount, 5 %. The total phenolic content was 21.55 mg gallic acid equivalent/gdw, whereas the antioxidant activity was 9.13 mmol TEAC (Trolox equivalent antioxidant capacity)//gdw and 178.34 mmol TEAC/gdw, respectively. The variables showed to significantly affect the total phenolic content (p < 0.05), but only temperature and ethanol amount influenced the antioxidant activity. Results suggest that ethanol could be used to replace non-food grade and environmentally problematic organic solvents, while the use of Tween 80 could improve the solid-liquid extraction.